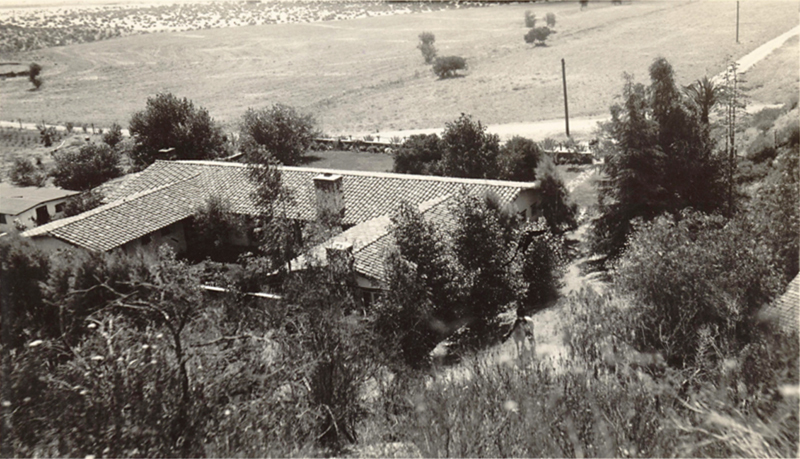 Photo of the Carey family's newly constructed adobe ranch home, built to replace the original wooden house that burned down in 1932. Today, this home is the centerpiece of the Tesoro Adobe Historic Park in the Tesoro Del Valle subdivision north of Copper Hill Drive. At the Nov. 3, 2005, dedication of the park, Harry Carey Jr. (Dobe) said the adobe for the bricks came from a hillside near the house. He said the construction cost was $3,000. "I think it was worth every penny of it," he said. "It's holding up pretty good." When the house was new, Dobe wrote his nickname in a newly poured concrete wall in the garden area. It's still there. He spelled it "Dobie." The rest of his life, he spelled it "Dobe." DC3301: 9600 dpi jpeg from original print courtesy of Harry Carey Jr.